Control every aspect of your image’s geometry. DxO ViewPoint automatically fixes skewed perspectives and restores subjects on the edges of the frame to their natural shape with just one click. Along the edges of photos taken with a wide-angle lens, bodies are stretched out and faces lengthened due to the phenomenon of âvolume deformation.â With just one click, DxO ViewPoint identifies the deformation and restores the subject to its natural shape. This exclusive DxO feature, especially useful for group and portrait photos, perfectly addresses this type of distortion. You can also make changes manually with the advanced controls: regulate the intensity of the correction and select the visible field in your image to create perfectly composed photos. DxO’s sophisticated processing engine allows you to flawlessly reproduce the progressive quality of a blur and even replicate bokeh shapes. Simulate the effects created by reducing the depth of field in an image, which normally requires using an expensive tilt-shift lens. Images retain their reliefâespecially when it comes to highlights. 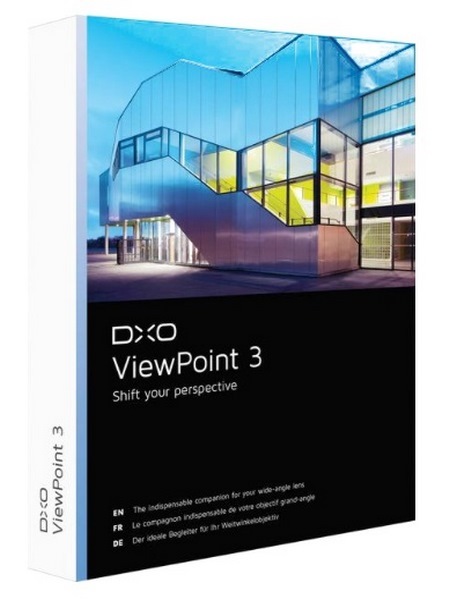 DxO ViewPoint can be used as a standalone application or as a plugin for DxO PhotoLab. It can also be used as an external editor with AdobeÂ® PhotoshopÂ®, AdobeÂ® Lightroom and AdobeÂ® Photoshop ElementsÂ®.